We have been in tiling for while and have vast experience in choosing bathroom tile. renovating the kids bathroom and we have also been helping our customers who are completely renovating,laying new tiles their bathrooms . PRIORTIZE YOUR MUST HAVE TILE . Typically when we start a bathroom, we have one tile that we visulaize of including in our design. Sometimes it is a really special or unique design tile and sometimes it is as quite simple as knowing that you want white subway tile. Either way, take that dream tile and use it as the initial starting point for the other tile you will choose for your bathroom design. KEEP IT TO NO MORE THAN 5 DIFFERENT TILES. Choosing your first (must have) choice as a Entry point, use it to make the choices and decisions for the other tiles you will include in your design. If your want to have a really unique color or pattern and is going to be the main attraction of your design, pull more subtle colors from it to use in your accent tiles. If however your first choice is really simple plain (like a white subway tile) you may want to some thing which showcasue an element of interest with a colorful accent tile or even a smaller scale white penny tile to change it up . you will choose a floor tile, a wall tile for the shower/ tub surround or even all of the walls in your bathroom, and an accent tile that will be used as a main Primary Staring poin. This is just a guideline. Don’t be skeptical to break the rules in choosing your dream tile. Stick to only ONE ATTRACTION. There are heaps of beautiful tiles out there and a bathroom is a perfect place to show off some of your tast and personality . take a risk with a unique color or pattern on your tiles. However, if you are going to go for it, keep it to one attraction. This will make your look timeless and really create the wow factor that you are going for since it won’t be competing with the other elements in the room. Many of these super awesome looking tiles can be pricey, but if you are laying in a small area like a bathroom, they might just be quite effordable since you won’t need too many square feet. Your Attractive area can be big or small, you are the decesion maker. The good majority of this bathroom is done in pretty basic white tile, but they added a wow factor with this beautiful tile at the top. Again the colors in this bathroom are pretty neutral, but the focal point is definitely the back wall of this shower. love the idea of going with a really focal point tile on the floor of a bathroom and keeping the rest of the space neutral. Are you ready to clean. 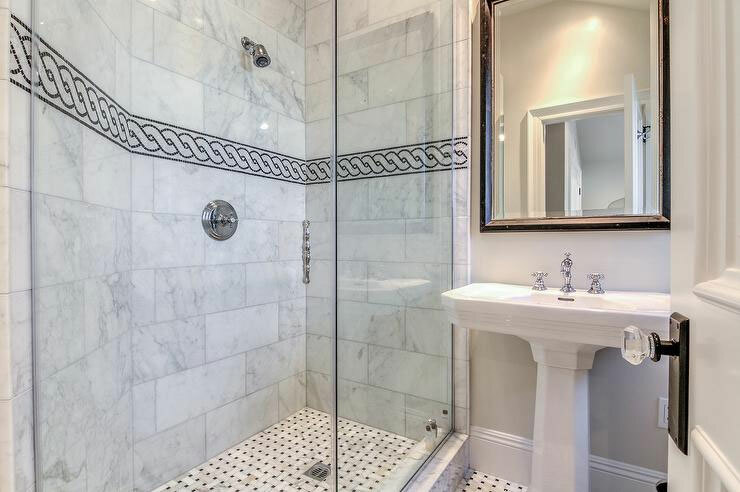 if you especially don’t like to clean the tub and shower so when choosing tile for these very wet areas you will need to go with porcelain or ceramic tile since they are virtually maintenance free.Tiles which are make from natural stone require more maintenance and do have to be sealed. They are definitely more so they tend to hold on to dirt and grim more. If you are wanting to add texture with stone, it would work to be a good idea to use it on the floor or in a less wet area. finally, glass tile is pretty and makes a great looking wall or accent tile. It is too slippery, so never work well on the floor.